It's a bit cooler than the other day, but still definitely salad weather! And hearty salads are great for the Weight Watcher's Core Plan, which I am following just now. I made a wheat berry salad (I'll post that later in the week), but I wasn't sure DH would like it, so I wanted to make an interesting potato salad as a back-up. It was both delicious and eye-appealing. NOTE: I only had regular onions, and this process makes the taste much less strong. I you want the onions really raw, use a sweet onion instead. Cover the potatoes with water and bring to a boil. Cover and simmer until they are tender, but still firm. (OR micro-steam them in a covered microwave-safe casserole for 8-10 minutes-- no water necessary.) Drain in a colander and peel them with your fingers under running cold water (or leave the peel on, if you prefer-- I did because I like the color of the pink-red peels). Drain them again and cut into medium dice, or thick slices, as desired. Toss the potatoes in a large bowl with vinegar, onions, tarragon and salt and pepper to taste. Set aside. Cook the beans in boiling water to cover for about 5 minutes, or until crisp-tender. Drain and cool under cold running water. Drain well again. (NOTE: If you use frozen baby peas, just cover them in boiling water and let thaw, then drain.) Fold the beans into the potatoes. Spread the corn (thaw the frozen kernels in boiling water, then drain first) on a cookie sheet sprayed with oil from a pump sprayer. Spray the top of the corn with a little more oil. Broil just until the corn starts to brown and char a bit around the edges and on top. To make the Vinaigrette, whisk together the Aquafaba or Fat-Free Oil Substitute, the vinegar and salt. Add the mayonnaise and blend until smooth with a stick/immersion blender (or blend in a blender or food processor). Pour the mixture over the potatoes and beans and stir gently, sprinkling with pepper to taste. Add the diced tomatoes and stir gently; taste for salt. Place in a serving bowl and refrigerate until serving time. Serve on crisp romaine lettuce leaves, if you like. 223.6 calories; 3% calories from fat; 0.9g total fat; 0.0mg cholesterol; 328.0mg sodium; 1120.5mg potassium; 49.4g carbohydrates; 5.8g fiber; 2.7g sugar; 43.6g net carbs; 7.2g protein; 3.7 points. I made this last night and it was GREAT!! I did not have any edamamé, so I used frozen green baby peas instead ... wished I had some limas ... those would have been perfect. Very filling and satisfing like potato salad should be, but without any of the tons of fat calories that one usually finds .... sometimes potato salad seems like more dressing than potatoes!! The tarragon and cider vinegar undertones really make this dish special!! It's wonderful!! 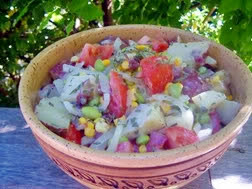 I'm going to try this potato and roasted corn salad tonight as I have corn ready from the garden as well as tomatoes and potatoes. I wish I had fresh tarragon. I really like the core weight watchers recipes I see you blogging about (as well as those in the newsletter too), nice change of pace!